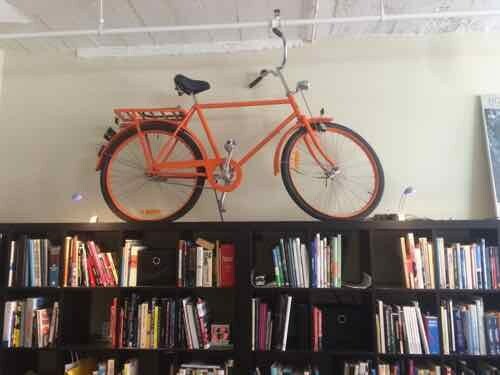 Prior to my February 2008 stroke, I’d bought numerous bicycles while living in St. Louis. 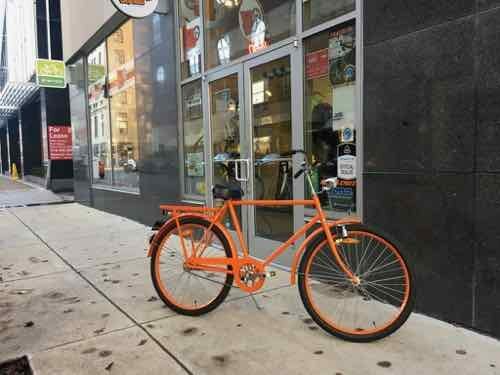 With two exceptions, all came from A & M Bicycles — at Arsenal & Morganford Rd. I bought my first bike from A & M back in the mid/late 90s, it was still owned by a descendant of the original founder. It wasn’t long after when the owner sold the shop to his employee, Karl Becker. Numerous bikes, new & used, were bought from Karl. A couple of times I needed a used beater bike, we’d go down to the basement and come up with exactly the bike I needed. The two bikes I bought elsewhere since 1990 were a used 50s Huffy fat tire at an antique store in the Kansas City River Market area, and a new Swedish Kronan bought sight unseen from a bike shop in San Diego. They disassembled it and shipped to Karl @ A & M, who assembled it. That was in 2004. 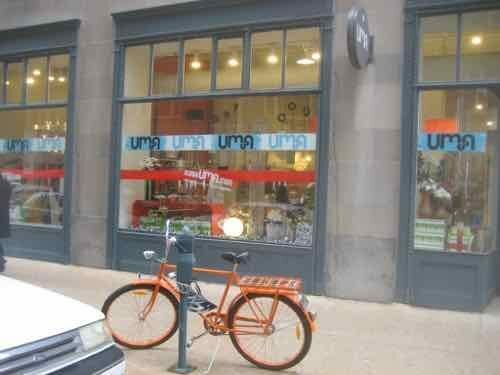 My bright orange Kronan bike in front of the former UMA store at 11th & Locust in December 2007 — this was in that short period after I moved downtown but before my stroke. After UMA moved to Chicago Rooster expanded into this space. This month we took the bike down from the shelves, yet something wasn’t right. The pedal would turn, but the wheel wouldn’t move. 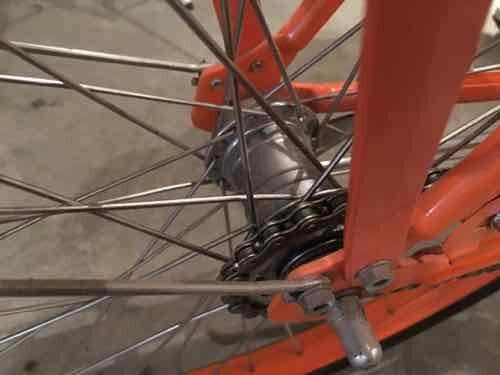 The coaster brake rear hub was the problem. I knew A & M was still open, but we have no bike rack for our car. Friends suggested Big Shark’s downtown location. A week later we walked it five blocks East to Big Shark. A few days later we returned to pick it up — the rear hub was freed up for less than $30. Repaired in from of Big Shark’s Urban Shark location on Locust. I haven’t ridden this bike in over a decade, but I just can’t part with it. Lots of great memories on this bike. It also reminds me of Karl.